BMW launches its second front-wheel drive vehicle built on the new UKL architecture. 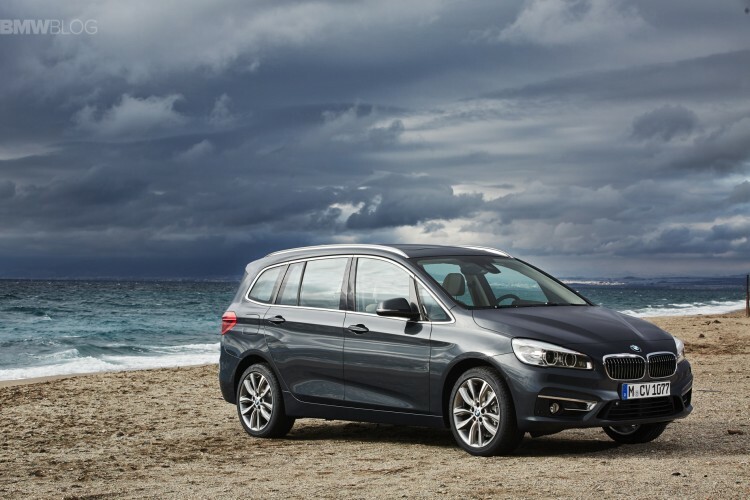 The BMW 2 Series Gran Tourer joins the 2 Series Active Tourer in the new family of compact vehicles. The seven seater Gran Tourer will make its world premiere next month at the 2015 Geneva Motor Show and will go on sale this summer. In addition to the standard version, the new BMW F46 2 Series Gran Tourer is available in a further four model variants: Advantage, Sport Line, Luxury Line and M Sport. The exterior dimensions are: 4,556 x 1,800 x 1,608 mm (179.3 inches long, 70.9 inches wide and 63.3 inches tall). A mere 214 millimeters longer and 53 millimeters higher than the BMW 2 Series Active Tourer, the new BMW 2 Series Gran Tourer provides a further significant increase in space thanks to its long wheelbase, measuring 2,780 millimeters. BMW 2 Series Gran Tourer offers ample space and a generous luggage compartment that can be extended in capacity from 645 to 805 liters (67.3 cubic feet). The optional third row of seats for two can be completely lowered into the loading floor. Standard are a high-quality AM/FM radio including a Bluetooth hands-free system and audio streaming in conjunction with compatible smartphones, the iDrive operating system with Controller on the centre console, Intelligent Emergency Call, a 6.5-inch color display and the Driving Experience Control switch with ECO PRO mode. Beyond this, every BMW 2 Series Gran Tourer also comes with an electronic parking brake, a front armrest, a rain sensor with automatic headlight activation, as well as Collision Warning with City. 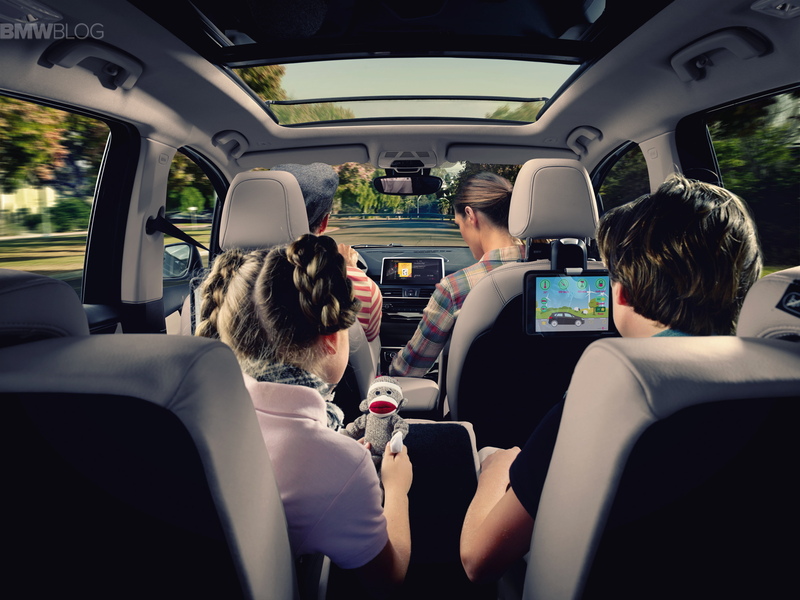 The Gran Tourer will be available with a custom-made myKIDIO entertainment system which includes information like speed, outside temperature and the answer to the question: are we there yet? The F46 Gran Tourer will be powered by three- and four-cylinder engines. 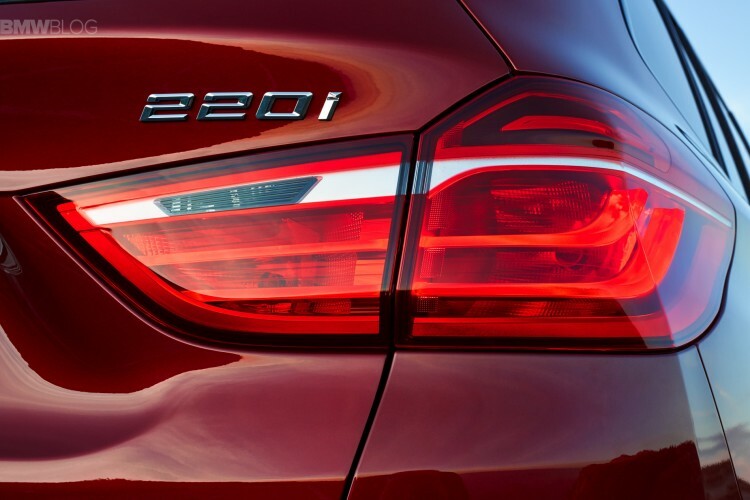 Gasoline engines are found in the 218i (3-cylinder, 134 hp) and the 220i (4-cylinder, 189 hp). Diesel fans can choose between the 114 hp 216d (3-cylinder), the 148 hp 218d (4-cylinder), and the 220d xDrive (4-cylinder, 187 hp). The engines are matted to a six-speed manual or an eight-speed automatic. BMW will only offer the xDrive in the 220d model. The design resembles a minivan with a premium look with the Hofmeister kink on the D-pillar and the typical kidney grille and double-round headlamps. In typical BMW style, the taillights form an L-shape, their two LED-fed light banks inclining towards the center to support the dynamic rear-end look. Aerodynamic solutions such as the aeroblades – vertical air deflectors – are placed behind the D-pillars round. For now, BMW will offer the Gran Tourer in Germany and remains to be seen if the U.S. market will decide to bring them over. 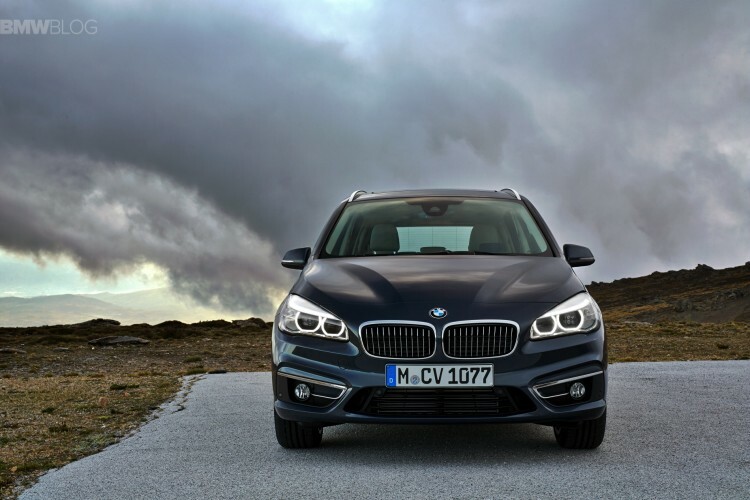 With the new BMW 2 Series Gran Tourer, BMW has carved out yet another new vehicle segment. 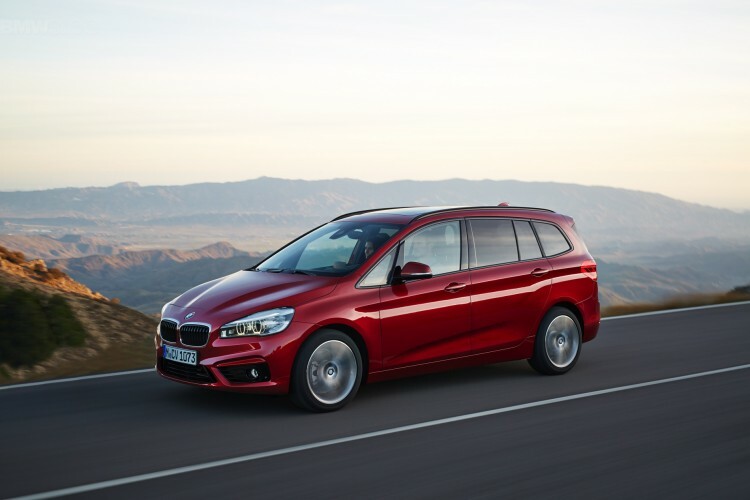 With its generous space, versatility and groundbreaking flexibility, the BMW 2 Series Gran Tourer is the world’s first premium compact model to offer up to seven seats and fully meet the mobility requirements of young families. Despite its compact dimensions – measuring just 4,556 millimetres long, 1,800 mm wide and 1,608 mm high – the new BMW 2 Series Gran Tourer offers ample space and a generous luggage compartment that can be extended in capacity from 645 to 805 litres. With the rear-seat backrests folded down, this rises to an impressive 1,905 litres of load space. Ensuring maximum variability is the standard-fitted fore-aft sliding rear seat bench – with a 40:20:40-split backrest that folds down at the press of a button – which allows three child seats to be fitted. Extending the possibilities even further is an optional third row of seats which can be completely lowered into the loading floor. Maximising the vehicle’s everyday practicality is a range of storage options for all three rows of seats, as well as rails on the front-seat backrests with fold-out tables attached. The new BMW 2 Series Gran Tourer is a pioneer in uniting the segment’s traditional attributes – such as spatial functionality and comfort – with the hallmark BMW values of dynamics, elegance and premium quality. In addition to the standard version, the new BMW 2 Series Gran Tourer is available in a further four model variants. The Advantage model offers enhanced functionality over the standard model, including, among other features, two-zone automatic air conditioning, Park Distance Control at the rear, Cruise Control with Braking function and a multifunctional steering wheel. The Sport Line model accentuates the sporting aspect with exclusive exterior specifications, special light-alloy wheels and sports seats, while the Luxury Line highlights its exclusivity with chrome applications, select lightalloys and leather appointments. Beyond these, the M Sport model comes with a choice of the M Aerodynamics package, BMW Individual high-gloss Shadow Line, M leather steering wheel and M Sport seats, among other features. With its exceptional roominess, high levels of everyday practicality and maximum flexibility, the BMW 2 Series Gran Tourer is the first spacefunctional vehicle in the premium compact segment to offer up to seven seats. It combines these attributes with traditional BMW values such as outstanding driving dynamics, exclusive elegance and premium quality. 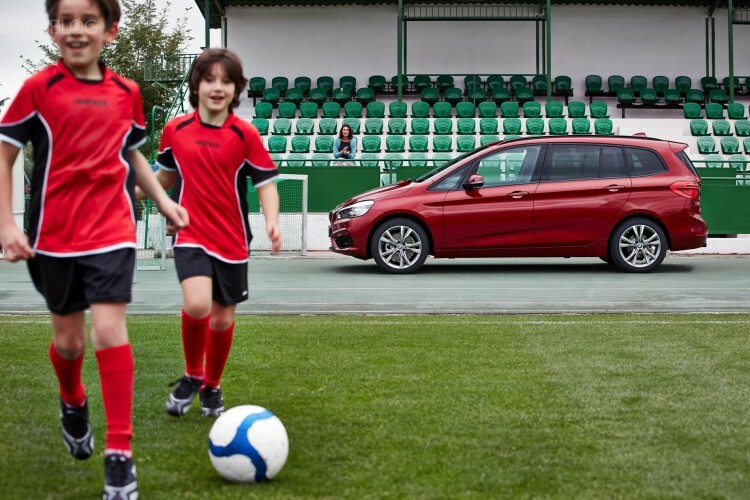 As such, the BMW 2 Series Gran Tourer meets the mobility requirements and expectations of young families for whom not only practicality and versatility are important selling points, but also sportiness and a leisure-oriented lifestyle. With its compact dimensions of just 4,556 x 1,800 x 1,608 mm (L x W x H), the new BMW 2 Series Gran Tourer – which shares BMW’s advanced frontwheel-drive architecture with transversely front-mounted engines with the BMW 2 Series Active Tourer – cuts a fine dash even in heavy city traffic. Yet it comfortably accommodates up to seven people while additionally offering a generous load compartment that extends from 645 to 1,905 litres in the fiveseater and from 560 to 1,820 litres in the seven-seater variant. 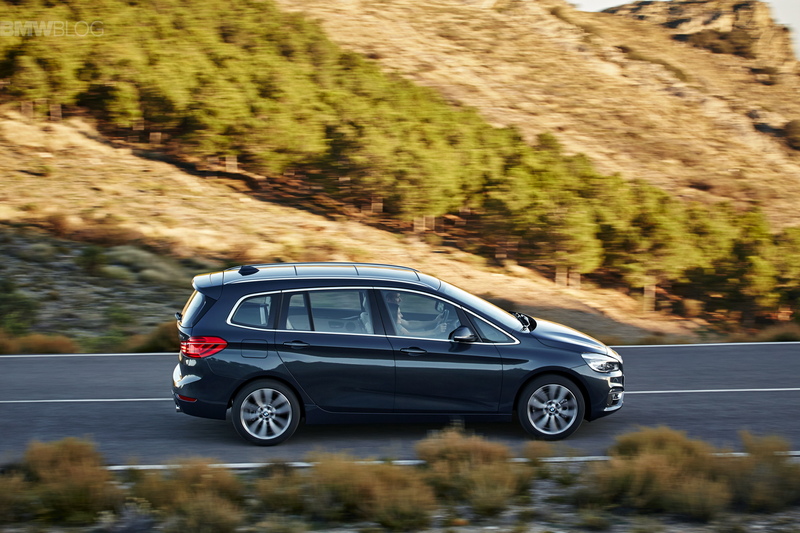 A mere 214 millimetres longer and 53 millimetres higher than the BMW 2 Series Active Tourer, the new BMW 2 Series Gran Tourer provides a further significant increase in space thanks to its long wheelbase, measuring 2,780 millimetres. The higher roofline allows driver and passengers to sit tall and upright while affording excellent all-round vision even in challenging traffic situations, as well as making it easier to get in and out of the vehicle. On top of that, the new BMW 2 Series Gran Tourer delivers the kind of legroom – particularly in the rear – that is normally the preserve of luxury cars. Another particularly useful feature is the sturdy, folding boot floor that conceals a further compartment with a handy multifunction tray offering 100 litres of storage space. This can be used, for example, to neatly stow away the optional spare wheel or the folding rear cycle carrier – optionally available from the Original BMW Accessories range (see chapter 7) – when not required. There is also room under the floor for the boot roller cover. Lashing points in the rear compartment and a multifunction bag hook on both the left and the right are further practical details that underline the practical nature of the new BMW 2 Series Gran Tourer. Yet another useful highlight inside the new BMW 2 Series Gran Tourer are the “monorails” on the backrests of the front seats, to which a high-quality folding table can be attached and adjusted for both height and tilt angle. Third row of seats for two extra passengers. 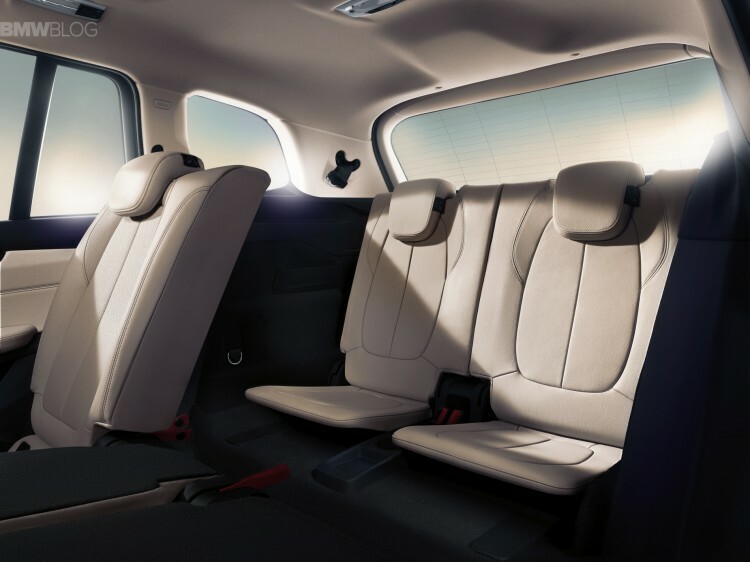 An optional third row of seats offering generous space for two additional passengers highlights the supreme flexibility of the new BMW 2 Series Gran Tourer. A non-slip step in the rear door opening allows for comfortable access in conjunction with the folding and sliding second row of seats (Easy Entry). Even in this configuration the boot still has room for small luggage items. If the extra passenger seats are not required, the third row can be completely lowered into the load area floor to save space. The loading surface remains almost level and the storage space – barring the multifunction tray – is fully maintained. Wide range of storage possibilities. The high degree of everyday practicality and flexible use of the new BMW 2 Series Gran Tourer is also reflected in its numerous storage compartments and spaces. A large compartment in front of the centre console, for example, is an ideal space to keep smartphones, glasses or keys. The area under the front centre armrest can also be fully utilised as a storage compartment. Two large, offset cupholders behind the gearshift lever securely hold any kind of drinking vessel without impeding gear changes. All the door panels, moreover, can accommodate bottles of up to 1.5 litres. Further travel accoutrements such as children’s toys can be stowed away in the hinged compartments under the front seats or in the storage compartments under the second-row seats. There are even spaces beside the third row of seats for tall, slim objects such as bottles or bicycle pumps. A special centre console with two cupholders and a storage compartment along with a 12-volt socket to charge electric gadgets also play their part in enhancing comfort and convenience on the move for passengers in the third row. The new BMW 2 Series Gran Tourer demonstrates its appreciation of family mobility requirements not least in the fact that up to three universal child seats can be mounted in the second row. And there is even the possibility of attaching two universal child seats in the third row. In true BMW tradition, the new BMW 2 Series Gran Tourer with its unique space-functional concept reveals its attributes at first glance. A long wheelbase and high roofline already point to the generous space that awaits in the interior. Precise lines, meanwhile, lend the BMW 2 Series Gran Tourer a stretched look and endow it with a particularly dynamic flavour. As a result, from whichever angle you look at it, the vehicle exudes a sporty, elegant and at the same time functional appearance with a high recognition factor. The BMW 2 Series Gran Tourer injects an unprecedented dose of dynamics into its vehicle segment. At the front end the hallmark trio of BMW icons – the twin kidney grille, twin round headlights and brand logo – unambiguously display the vehicle’s family affiliation. Despite the spacious interior, the front aspect is sporty and flat. The interplay of a low windscreen and high engine compartment cover significantly reduces the perceived height of the BMW 2 Series Gran Tourer, while the clearly defined and muscularly sculpted bonnet leaves no doubt as to the engine power lurking beneath it. Along with the focused look of the twin round headlights, the powerful play of lines that accentuate the car’s width and the large air intakes sited on the far edges of the front, it all makes for a sporty, agile front-end look. As an option, efficient bi-LED lights are available for the dipped and main beam functions. These lights are as bright as a comparable xenon light system with daytime running light rings in LED technology, but use only half as much energy. LED cornering lights allow for adaptive light distribution with enhanced lateral illumination in urban traffic (dimmed) when making a turn at speeds of up to 40 km/h (25 mph) and as non-swivelling illumination at up to 70 km/h (44 mph). The LED daytime running and side lights in the light tubes of the main headlamp guarantee an unmistakable look. Dynamic from every angle. The proportions alone of the new BMW 2 Series Gran Tourer signal at first glance the high degree of functionality embedded in this vehicle concept. In familiar BMW style, the long wheelbase and short overhangs create a dynamic keynote. This is further heightened by the striking bonnet and its forwardslanting kidney grille that makes the vehicle appear to be surging forward even when stationary – an impression reinforced by the inclined D-pillar. Within the vehicle’s silhouette, distinctive lines engender a dynamic body language. Rising towards the rear, they give the side view a clear wedge shape, while additional light surfaces above the rear wheel underline the prominent shoulder area. 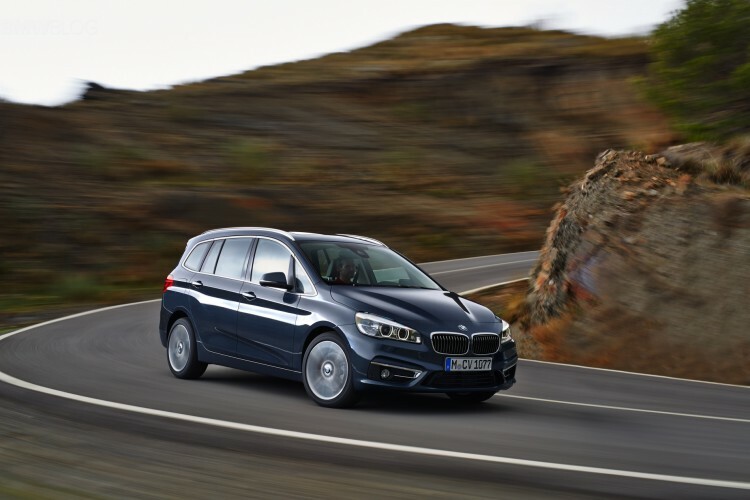 The BMW 2 Series Gran Tourer also lends graphic expression to its functional qualities through the open curve of BMW’s hallmark Hofmeister kink in the D-pillar, with the expansive side glazing accentuating the spacious interior and its attendant versatility. A high roofline and large doors promise comfortable access to all seats. Aesthetic functionality. The functional aspiration of the new BMW 2 Series Gran Tourer is perpetuated in the design of the rear end. Its surfaces and lines define a precise and solid structure which, despite the vehicle’s height, creates a broad, sporty impression. The low loading sill and wide-opening tailgate guarantee comfortable access to the load compartment. The large tail lights extend far into the side walls, harmoniously fusing the side and rear of the BMW 2 Series Gran Tourer and lending it a solid road-hugging stance. In typical BMW style, the tail lights form an L-shape, their two LED-fed light banks inclining towards the centre to support the dynamic rear-end look. Aerodynamic solutions such as the aeroblades – vertical air deflectors – behind the D-pillars round off the dynamic, cutting-edge aesthetics of the rear. The expansive surfaces and roomy design of the interior, with space for up to seven people, also lend visual expression to the functional character of the BMW 2 Series Gran Tourer while generating an airy feeling of space. The strongly horizontal configuration and layering of surfaces and volumes make the cabin feel light and roomy. At the same time, the hallmark BMW drivercentric design and the clear focus on the road leave no doubt that the new BMW 2 Series Gran Tourer carries the sporting genes common to all BMW models. A high seating position not only makes for an optimal overview and operation of switches and controls; in conjunction with the added triangular window in the A-pillar, it also enhances all-round visibility. The visual demarcation between the centre console and the instrument panel gives the latter the appearance of floating in the air. Electroplated elements and large trim surfaces with accent strips accentuate the modern, high-quality design of the interior. 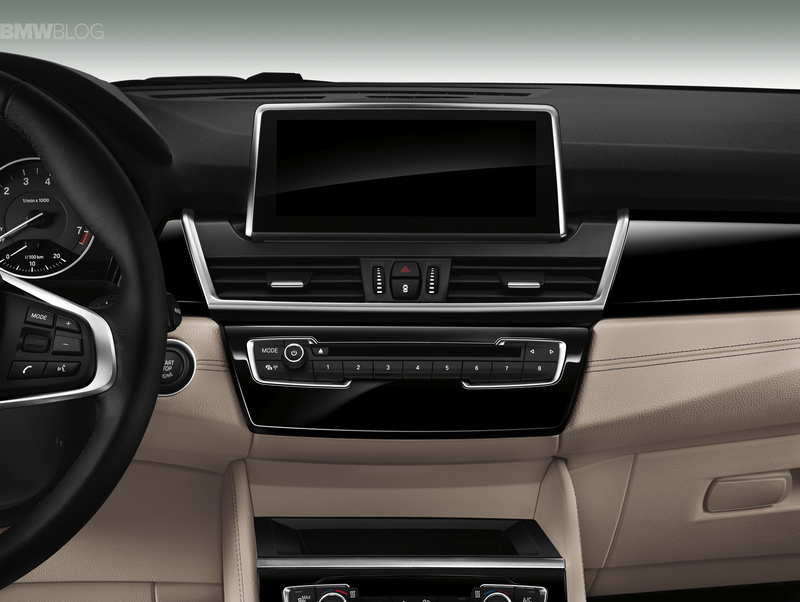 This premium ambience is further underlined by the freestanding central Control Display. A wealth of storage spaces and compartments in the new BMW 2 Series Gran Tourer guarantee maximum everyday practicality and versatility. Take, for example, the compartment in front of the centre console, which can be used for smartphones, glasses or keys, or the two large cupholders behind the gearshift lever, the large bottle holders in all doors and the stowage areas under the seats. In addition to the standard version, the new BMW 2 Series Gran Tourer can be further customised by choosing from four other model variants that each place their own particular slant on the vehicle – Advantage, Sport Line, Luxury Line and M Sport – as well as from a host of options for adding individual touches both inside and out. Whereby the new BMW 2 Series Gran Tourer already comes generously appointed with features for enhanced functionality, driving safety and comfort even in standard guise. 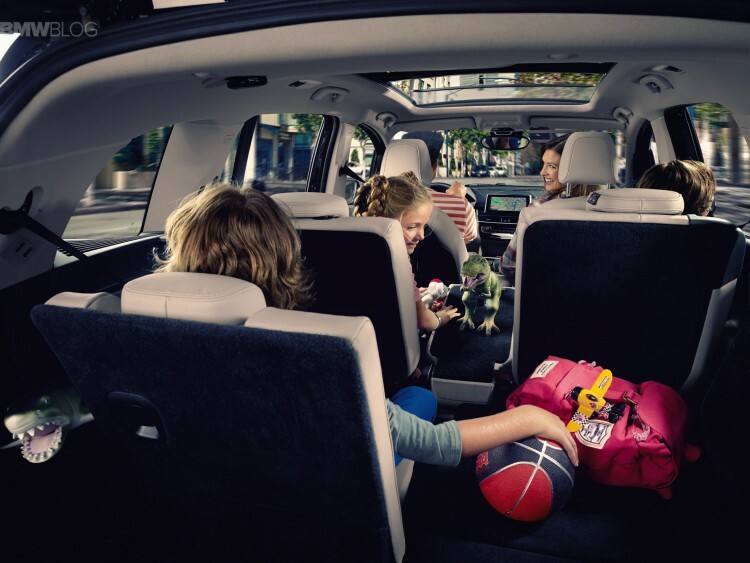 To ensure supreme everyday usability and maximum versatility, the standard specification of the new BMW 2 Series Gran Tourer includes a sliding rear seat that folds down flat and also allows up to three child seats to be fitted. Practicality is given a further boost by the foldable luggage compartment floor, bottle holders in all four doors, stowage compartments under the front and rear seats, plus an array of other storage facilities. A third row of seats, which disappears out of sight underneath the luggage compartment floor when not in use, as well as a folding passenger seat are available as options. Also included as standard are a high-quality AM/FM radio including a Bluetooth hands-free system and audio streaming in conjunction with compatible smartphones, the iDrive operating system with Controller on the centre console, Intelligent Emergency Call, a 6.5-inch colour display and the Driving Experience Control switch with ECO PRO mode. Beyond this, every BMW 2 Series Gran Tourer also comes with an electronic parking brake, a front armrest, a rain sensor with automatic headlight activation, as well as Collision Warning with City. BMW offers numerous features for the BMW 2 Series Gran Tourer that have been designed to raise standards of comfort, driving safety and motoring pleasure yet further. Besides a panoramic sunroof, automatic tailgate opening (also hands-free), Dynamic Damper Control and variable sport steering, there is also the option of a Head-Up Display. This projects all readouts from the driver assistance systems, navigation information and the current speed in full colour onto a transparent screen, which extends out between the steering wheel and windscreen in the driver’s immediate field of view. The new camera-based Driving Assistant Plus feature additionally includes cruise control with Stop & Go function and a Traffic Jam Assistant. To provide the greatest possible scope for personalising the BMW 2 Series Gran Tourer, there is also a wide selection of exterior colours, interior trim strips and light-alloy wheels. 13 different paint finishes are available in all, while the choice of wheels includes nine different designs ranging in size from 16 to 18 inches as an alternative to the 16-inch light-alloy wheels fitted as standard. 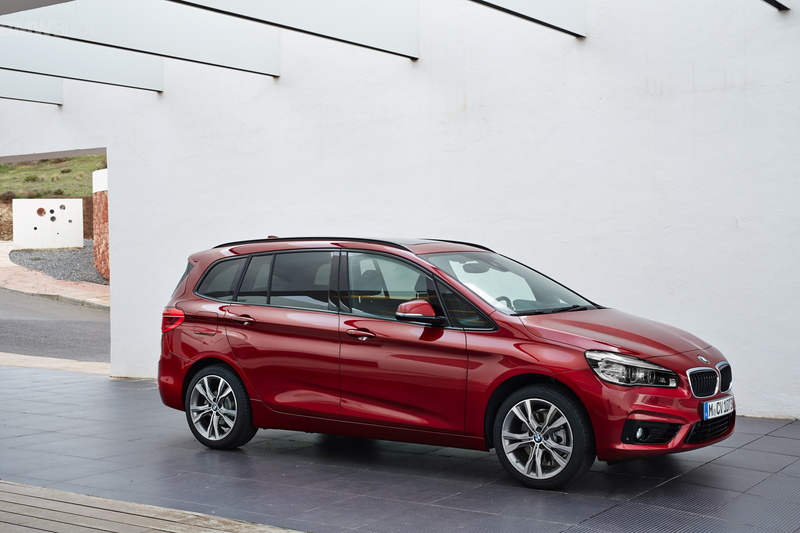 BMW offers a total of four model variants for tailoring the BMW 2 Series Gran Tourer even more closely to individual requirements. The Advantage version already adds 2-zone automatic air conditioning, Park Distance Control at the rear, front foglamps, cruise control and a multifunction steering wheel to the standard specification. The Sport Line model, meanwhile, additionally brings the dynamic character of the BMW 2 Series Gran Tourer more to the fore with 17-inch light-alloy wheels, sports seats and bodywork detailing in high-gloss black. Exclusiveness and elegance are the order of the day in the Luxury Line model, which offers an enticing blend of understated chrome trim, interior trim strips in fine wood, exclusive leather upholstery, heated front seats, as well as 17-inch light-alloy wheels in a line-specific design. Finally, there is the M Sport model, which maximises the car’s on-road presence. Featuring the M Aerodynamics package, BMW Individual High-gloss Shadow Line trim, sports seats in exclusive upholstery, M leather multifunction steering wheel and two exclusive M light-alloy wheel designs in 17- and 18-inch formats, it lets the BMW 2 Series Gran Tourer show off its dynamic prowess to particularly striking effect. BMW ConnectedDrive for optimum connectivity. 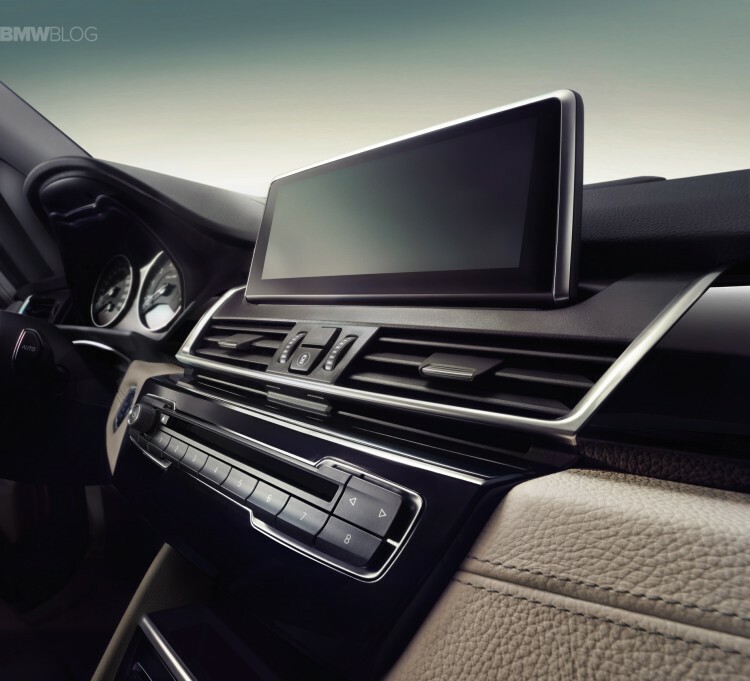 BMW is unquestionably the trailblazer of the automotive industry when it comes to connectivity between vehicle, driver and the outside world, and it was quick to integrate the digital world into its vehicles under the umbrella of BMW ConnectedDrive. The unrivalled portfolio of driver assistance systems, digital services and apps are offered either as standard or as optional extras and ensure the ultimate in convenience and infotainment. The high standards of safety can be further increased by a new generation of assistance systems that work on the basis of image data. These include the Collision and Pedestrian Warning with City Braking function, the camera-based cruise control system with Stop & Go function, the Traffic Jam Assistant, Speed Limit Info Memory, the High Beam Assistant and the Lane Departure Warning system. The Parking Assistant, meanwhile, takes the hard work out of parallel parking with the help of ultrasonic sensors. With the standard-fitted Intelligent Emergency Call, BMW already offers a system whose automatic positioning and accident severity detection abilities go far beyond the functionality required by law in 2015. Should the airbags be triggered in an accident, sensors detect the type of accident, the potential injury risk and which seats are occupied. Intelligent Emergency Call relays this data together with the vehicle’s location and the vehicle model to the BMW Call Centre. The Call Centre agent establishes telephone contact with the occupants of the crashed vehicle and rapidly arranges the best possible emergency response on the basis of all the available information. Intelligent Emergency Call can also be triggered manually, for instance to summon aid for other road users. Other services are designed to offer added convenience. Real Time Traffic Information (RTTI) keeps the driver up to date with what’s happening out on the road practically in real time, and is therefore able to recommend an alternative route as soon as traffic ahead starts to slow down. The Concierge Service places a call to a Call Centre agent, who is able to do anything from locating the nearest out-of-hours pharmacy and sending the route to the vehicle’s navigation system, all the way to reserving a hotel room. Smart in-car entertainment programme for the rear passengers. The BMW 2 Series Gran Tourer lives up to its billing as an ideal family car by allowing the “myKIDIO” app from BurdaNews and Deutsche Telekom to be integrated into the vehicle for the first time, which means it can be operated using the iDrive Controller and the Control Display (initially only available in Germany). “myKIDIO” offers subscription access to high-quality content such as children’s audio books, audio plays, movies and TV series. In the BMW 2 Series Gran Tourer, a journey monitor known as the “BMW Kids Cockpit” can also be launched with the app for displaying data relating to the vehicle such as current speed. The application can furthermore be used to control any tablet computers in the car (e.g. Apple iPad), which are frequently used by children in the rear, particularly on longer journeys and often together with headphones. For instance, the driver or front passenger can see in the Control Display how much time an audiobook or movie has left to run to avoid breaking the journey in the middle of the most exciting part. Or they can use the iDrive Controller to start or pause a new movie, an audiobook or the “BMW Kids Cockpit” – a very handy function if the children on the rear seats are still too small to reach the control buttons themselves. When the “myKIDIO” channel is switched on, background uploading of new video content automatically takes place on the home WiFi network, so that the only thing the family has to remember to do when travelling by car is to take the tablet with them. And in conjunction with he BMW LTE hotspot, any special requests during the journey can also be downloaded to the playlist or watched directly as an online stream. Once the mobile device has been connected with the vehicle by means of a USB cable or snap-in adapter and the app has been launched, journey information can be displayed on the connected tablet computers. Adapted to the age of the occupants, this might include, for example, the remaining journey time, the vehicle’s current speed, the remaining distance and the outside temperature. When driving with the “BMW Kids Cockpit” and a special child-friendly representation of a BMW car, stars can be additionally collected for the distance covered – the longer the journey, the more stars are credited. These stars can then be redeemed for new vehicles in the “BMW Kids Cockpit”. To enable apps to be used safely and easily when driving as well, the BMW Group was quick to press ahead with the integration of smartphones in its cars and has already certified numerous apps for use in BMW vehicles. Such apps have been specially tested by BMW to check that they can be used safely in the vehicle with the iDrive operating system and the Control Display. They employ the A4A (Apps for Automotive) technology from BMW. Five lightweight, powerful and fuel-efficient petrol and diesel engines will be available from market launch of the new BMW 2 Series Gran Tourer, all featuring the latest BMW TwinPower Turbo technology. The three- and fourcylinder versions of the new engine family make their mark with a sporty power curve and exemplary efficiency while playing a key role in guaranteeing superior driving dynamics and the hallmark brand driving experience. In addition to the four-cylinder petrol engine in the BMW 220i Gran Tourer and the three-cylinder in the BMW 218i Gran Tourer, three diesel units round off the engine portfolio available at market launch. They include the fourcylinder diesel in the BMW 220d xDrive and BMW 218d Gran Tourer as well as the three-cylinder diesel in the BMW 216d Gran Tourer. All engines comply with the EU6 exhaust standard. Power is sent to the front wheels via a six-speed manual gearbox; as an option, BMW offers a six-speed Steptronic transmission1) for the three-cylinder engines, while the four-cylinders can avail themselves of an eight-speed Steptronic transmission (standard in the BMW 220d xDrive Gran Tourer). All transmissions feature the Auto Start Stop function, which improves fuel economy. The Steptronic version also offers an efficiency-boosting coasting function. As soon as the driver releases the accelerator at higher speeds, the engine is decoupled from the rest of the powertrain and continues in coasting mode to cut fuel consumption and CO2 emissions even further. New engine family espouses power and lightweight construction. The new engine family is based on an all-aluminium core unit designed for ultra-low friction. The closed-deck crankcase is particularly rigid, while thermally joined cylinder liners with twin-wire, arc-sprayed coating reduce weight as well as friction. A balancer shaft or two counter-rotating balancer shafts in the three- and four-cylinder engines respectively ensure smooth running across the entire rev range. The petrol engines feature turbochargers integrated in the exhaust manifold and liquid cooling for the manifold as well as the aluminium turbine housing. The exhaust gases cover only a short distance to the turbocharging system, making for agile response, while the very short warm-up time reduces interior friction in the system and with it fuel consumption. The close-coupled location of the catalytic converter and the electrically controlled boost pressure control valve – or wastegate – also have a positive impact on the emissions of the petrol engines. All petrol and diesel units in the new engine family come with the latest version of BMW TwinPower Turbo technology. The petrol engines feature turbocharging, direct petrol injection, Double-VANOS variable camshaft control and VALVETRONIC fully variable valve control. The technology package for the thermodynamically optimised diesel engines includes turbocharging, variable turbine geometry and common rail direct injection with a maximum pressure of 2,000 bar. These world-leading features have enabled BMW to optimise performance while ensuring high levels of efficiency. As such, the members of this new engine family have once again raised the bar on both fronts. Thanks to high peak output, spontaneous throttle response and high pulling power, the four-cylinder petrol engine already familiar from the Active Tourer helps the BMW 220i Gran Tourer achieve supreme performance coupled with fuel efficiency (fuel consumption combined: 6.4–6.2 l/100 km [44.1– 45.6 mpg imp]; CO2 emissions combined: 149–144 g/km)*. The 2.0-litre inline unit has its peak output of 141 kW/192 hp on tap from 5,000 rpm, while peak torque is available between 1,250 and 4,600 rpm. A sporty performance curve propels the BMW 220i Gran Tourer from 0 to 100 km/h (62 mph) in 7.7 seconds and on to a top speed of 223 km/h (138 mph). The BMW 218i Gran Tourer (fuel consumption combined: 5.5–5.1 l/100 km [51.4–55.4 mpg imp]; CO2 emissions combined: 127–119 g/km)* is driven by an extremely compact and lightweight three-cylinder petrol engine. Thanks to BMW TwinPower Turbo technology, it impresses with high performance and exemplary efficiency. Ensuring maximum running smoothness throughout the engine speed range are a balancer shaft and the combination – rare in this class – of a dual-mass flywheel and centrifugal pendulum absorber. The 1.5-litre three-cylinder unit develops 100 kW/136 hp from 4,400 rpm. Peak torque of 220 Nm (162 lb-ft) is already available from 1,250 rpm and can be increased to 230 Nm (169 lb-ft) for short periods by using the overboost function. The BMW 218i Gran Tourer with six-speed manual gearbox accelerates from from 0 to 100 km/h (62 mph) in 9.5 seconds. Top speed is 205 km/h (127 mph). The top performer in the engine line-up comes in the shape of the 2.0-litre four-cylinder diesel powering the new BMW 220d xDrive Gran Tourer (fuel consumption combined: 5.1–4.9 l/100 km [55.4–57.6 mpg imp]; CO2 emissions combined: 133–128 g/km)*. With a peak output of 140 kW/190 hp at 4,000 rpm and a maximum torque of 400 Nm (295 lb-ft) at 1,750 rpm, this BMW Gran Tourer offers extremely dynamic propulsion. This diesel model, moreover, is the only vehicle in the premium compact segment with up to seven seats and comes with all-wheel drive as standard. BMW xDrive distributes power to all four wheels as required, thus optimising traction and driving stability in all road and weather conditions. This intelligent all-wheeldrive system also improves cornering dynamics for the BMW 220d xDrive Gran Tourer. The torquey diesel completes the 0 to 100 km/h (62 mph) dash in just 7.6 seconds and effortlessly accelerates all the way to 218 km/h (135 mph). The BMW 218d Gran Tourer (fuel consumption combined: 4.5–4.3 l/100 km [62.8–65.7 mpg imp]; CO2 emissions combined: 119–114 g/km)* is likewise driven by a 2.0-litre four-cylinder diesel. This unit is distinguished by its refinement and high power output combined with high levels of efficiency and economy. The new BMW 218d Gran Tourer develops a maximum output of 110 kW/150 hp at 4,000 rpm and a maximum torque of 330 Nm (243 lb-ft) between 1,750 and 2,750 rpm, taking this Gran Tourer from standstill to 100 km/h (62 mph) in 9.3 seconds and on to a maximum speed of 205 km/h (127 mph). The 1.5-litre three-cylinder diesel engine in the new BMW 216d Gran Tourer (fuel consumption combined: 4.2–3.9 l/100 km [67.3–72.4 mpg imp]; CO2 emissions combined: 111–104 g/km)* sets impressive standards, yet again corroborating the leading position of BMW diesel technology in terms of efficiency. Featuring a balancer shaft, dual-mass flywheel and centrifugal pendulum absorber, the BMW 216d Gran Tourer diesel develops 85 kW/116 hp at 4,000 rpm and 270 Nm (199 lb-ft) of torque from as low as 1,750 rpm, taking it to a top speed of 192 km/h (119 mph) and from rest to 100 km/h (62 mph) in 11.1 seconds. With average fuel consumption of 4.2 – 3.9 litres of diesel per 100 kilometres (67.3– 72.4 mpg imp ) and commensurately low CO2 emissions of 111 to 104 grams per kilometre, the BMW 216d Gran Tourer is the most economical, environmentally friendly and efficient vehicle in its class. BMW will this year be adding further engines and an extra drive variant to the engine portfolio of the new BMW 2 Series Gran Tourer. The BMW 216i will be launched as the entry-level petrol engine, while the BMW 220d Gran Tourer is set to join the line-up as a front-wheel-drive variant with manual or automatic transmission. Among the stand-out attributes of the new BMW 2 Series Gran Tourer are its superior dynamics and the kind of driving experience typically associated with BMW. Playing a key part in this is the sophisticated suspension technology, which perfectly complements the vehicle’s state-of-the-art front-wheel-drive concept. Indeed, the engineers have succeeded in uniting its agile handling characteristics with a high degree of ride comfort. The dynamic handling qualities of the BMW 2 Series Gran Tourer are in the first instance down to its coherent overall concept. Here BMW focused on a perfectly configured chassis with a wide track, a reduced-friction steering system, a torsionally very stiff and lightweight body, a low centre of gravity and honed aerodynamics. Even the base version of this chassis combines hallmark brand agility and directional control with suspension comfort. The driven front axle provides sensitive steering feedback while minimising unwanted torque-steer influences. Single-joint front spring-strut axle. The single-joint spring-strut axle of the BMW 2 Series Gran Tourer boasts lightweight and very rigid components as well as perfectly calibrated axle kinematics and elastokinematics. The suspension thus provides the perfect platform for agile cornering performance, outstanding directional control and steering that is largely free of torque steer. Aluminium swivel bearings, the use of high-strength steels in the axle subframe and wishbones and a hollow variable-gauge anti-roll bar reduce unsprung masses. High-quality mountings and bearings along with precisely calculated elastokinematics ensure a high degree of rolling comfort. The front and rear dampers are decoupled from the body using elaborate three-way support mounts. Multi-link rear axle. 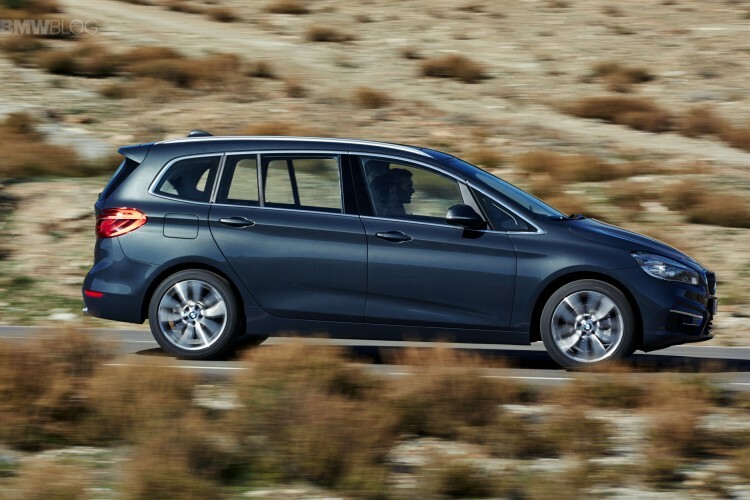 The rear axle likewise plays a pivotal role in the excellent driving dynamics of the new BMW 2 Series Gran Tourer. Its compact multi-link design with particularly stiff control arms and a hollow anti-roll bar perfectly complements the sporty front-wheel-drive set-up, while the separate springs and dampers benefit the space-functional concept. Carefully calibrated wheel bearings and ball-and-socket joints as well as rubber mounts on the wheel carriers optimise camber stiffness for enhanced directional stability. Electromechanical “single-pinion” steering. In the new BMW 2 Series Gran Tourer an electromechanical power steering system delivers highly precise steering and unequivocal feedback. To maintain the familiar BMW steering characteristics in a front-wheel-drive model as well, the hardware and software have been perfectly tailored to the drive concept. The servo unit and steering gear form a single component so that the steering assistance acts directly on the single pinion. Torque steer has been minimised thanks to precisely calculated elastokinematics and meticulous software calibration, while engine forces are counteracted by optimally designed engine and transmission mounts along with the engine pendulum mount. The upshot is impressively agile and sporty steering that conveys a typical BMW steering feel with clearly defined feedback. The BMW 2 Series Gran Tourer is thus a class-leader in terms of steering precision, directional control and response, among other qualities. The new BMW 2 Series Gran Tourer features high-performance swingcalliper brakes and inner-vented discs at the front. This lightweight system is distinguished by its stability, ease of operation and precise controllability. In some engine variants a brake cooling duct improves its outstanding heat tolerance even further. The foot-operated electric parking brake frees up space on the centre console. Electronic control systems for improved driving dynamics. A wide range of electronic control systems that boost safety and dynamics in equal measure equip the new BMW 2 Series Gran Tourer with the driving pleasure that is a byword for the brand. The DSC (Dynamic Stability Control) system includes ABS, DTC (Dynamic Traction Control), EDLC (Electronic Differential Lock Control) and Performance Control, as well as subfunctions adapted to the front-wheel-drive system – such as a torque interface – that optimise the interplay between engine and chassis. The driving dynamics of the new BMW 2 Series Gran Tourer are supported by specially configured control systems. In DTC mode the intervention of the stability control is slightly delayed to allow the BMW 2 Series Gran Tourer the appropriate amount of wheel spin for maximum acceleration. In DSC Off mode, precisely controlled brake power is applied at the front wheels to simulate the effect of a mechanical differential lock (EDLC function) for a significant improvement in traction when accelerating out of bends. Performance Control also heightens the agility of the BMW 2 Series Gran Tourer. This system positively influences the vehicle’s self-steering properties by suppressing the typical front-wheel-drive understeer tendency even before a critical level of stability is reached. Standard specification also includes the Start-Off Assistant, Dry Braking function, Brake Standy and Fading Compensation, while extra-sporty acceleration can be achieved with the aid of the Launch Control that comes as standard in conjunction with the eight-speed Steptronic transmission. The 10-millimetre-lower M Sport suspension that is a feature of the M Sport model is also available as a separate option. It is based on a tauter spring/damper calibration as well as stiffer anti-roll bars. In the M Sport version, the BMW 2 Series Gran Tourer features 17-inch or 18-inch M lightalloy wheels. As an alternative, drivers can choose a chassis with Dynamic Damper Control. Using the Driving Experience Control switch, motorists can choose between two different damping settings depending on the driving situation. Variable sport steering allows the BMW 2 Series Gran Tourer to be steered with even greater agility and precision. Parking and turning manoeuvres require less steering input and, at higher speeds, variable sport steering ensures greater straightline stability, maximum track holding and very precise directional control. The new BMW 2 Series Gran Tourer also offers the driver the option of sporty, comfortable or particularly economical overall vehicle settings based on the driving situation or personal preference. ECO PRO, SPORT and COMFORT modes are available via the Driving Experience Control switch in front of the centre console. A press of a button calls up a predefined set-up that configures the powertrain and chassis components accordingly. The driving pleasure on tap in the new BMW 2 Series Gran Tourer is not just down to the brand’s typical driving dynamics but also thanks to exemplary levels of fuel economy. The latter comes courtesy of the BMW EfficientDynamics development strategy and its raft of measures that extend to virtually every facet of the vehicle. And it is one of the reasons why the new BMW 2 Series Gran Tourer occupies a prime position in terms of performance and fuel efficiency not only among its direct competitors. On-demand operation of ancillary units and ECO PRO mode. In the new BMW 2 Series Gran Tourer the ancillary units and electric consumers form part of an intelligent energy management system. Ondemand operation of the coolant pump, a map-controlled oil pump and Electric Power Steering that consumes energy only when required all contribute to reducing fuel consumption. ECO PRO mode, activated via the Driving Experience Control switch, also helps the driver achieve an efficient and frugal driving style without compromising on comfort. This feature enables an improvement in fuel economy of up to 20 per cent, while the coasting function (Steptronic only) and ECO PRO Route (in conjunction with the navigation system) can save yet more fuel. Intelligent lightweight design: high driving dynamics, low fuel consumption. Intelligent lightweight design plays a critical role in achieving efficiency and agility while also boosting the dynamic driving qualities of the new BMW 2 Series Gran Tourer. High-tensile and ultra-high-tensile multi-phase steels and components that are precisely tailored to their purpose (so-called tailored blanks) lend the body a high degree of stiffness coupled with extremely low weight. 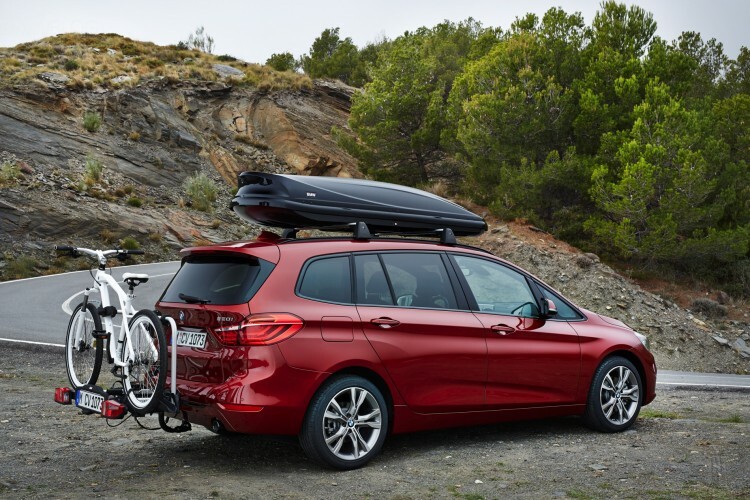 Along with the use of state-of-the-art composite materials, the application of aluminium also ensures that the new BMW 2 Series Gran Tourer brings no excess weight to the scales. The bumper supports, steering shaft, brake guards and wheel swivel bearings are all made of aluminium to whittle down weight, improve the trademark BMW driving dynamics and secure outstanding fuel economy. Aerodynamics: best drag factor in its class. With a drag coefficient of cd = 0.28 the new BMW 2 Series Gran Tourer creates a new benchmark for its class. Beyond its streamlined proportions, it is above all the front and rear end and the largely smooth-surfaced underbody panelling that have been aerodynamically optimised. The familiar BMW Air Curtain at the front apron creates a curtain of air in front of the wheel arches to reduce turbulence at the front wheels. The integration of the roof spoiler with the D-pillar trailing edges (aeroblades) optimises rear-end air flow, while the trailing edges of the rear lights serve to reduce drag further. Finally, on-demand control of the air flaps behind the BMW kidney grille and in the lower cooling air intake also play their part in securing the exemplary cd value and low fuel consumption of the new BMW 2 Series Gran Tourer. A further benefit of reducing drag is to diminish noise inside the car. Next post Teen Driving – How can we improve that in the U.S.